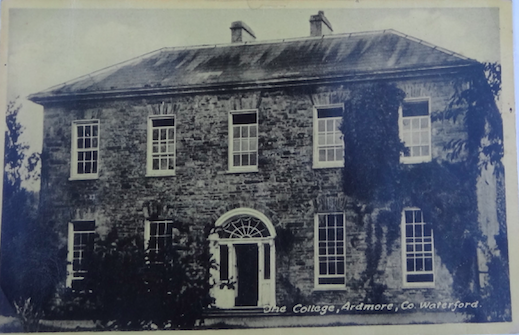 Originally named Ardmore House, then Monea House, became an estate house for the Bagge family. In the 1850s Simon Bagge was leasing this house from the Ecclesistical Commissioners of Ireland so this may have originally been a rectory. A John Bagge arrived in Co. Waterford in the early 1600s, in a century when the Irish population saw a massive inwards migration of approx 1 million people. By the mid-1830s the Bagge’s had over 3000 acres in Co. Waterford. The family sold their estate in the early 1920s. Monea House served as Coláiste Deuglán and although demolished, the boundary wall between the Round Tower Hotel & McNamara’s is believed to retain some of the side wall of Monea House.